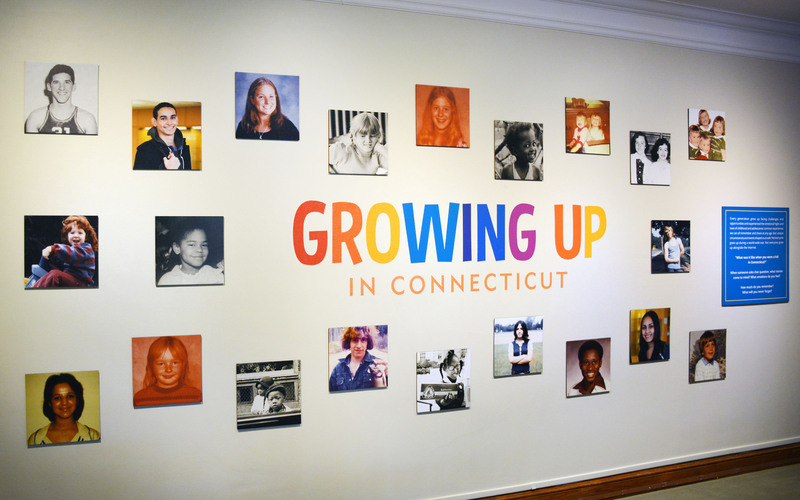 Growing Up in Connecticut was a museum exhibit showcasing the emotional highs and lows of childhood and adolescence for the CHS. 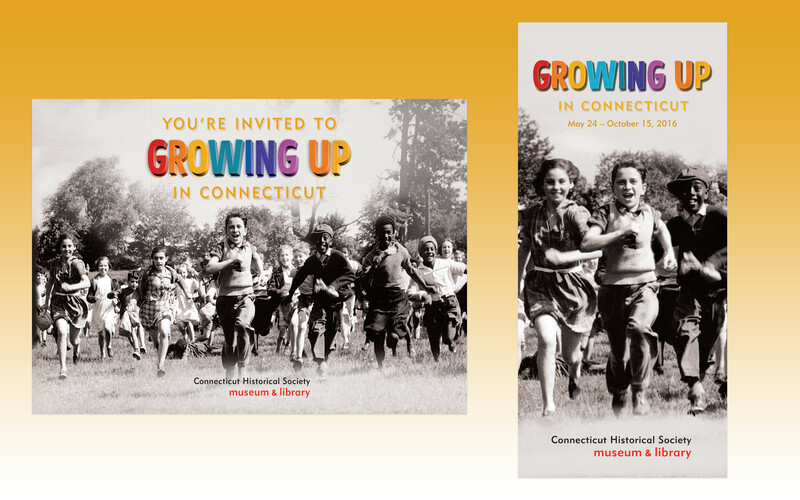 It promoted cross-generational understanding and conversation through collected objects and stories about growing up in Connecticut. My role was to create a branding identity, offer an online gallery solution, design graphics, and handle production of exhibit components. 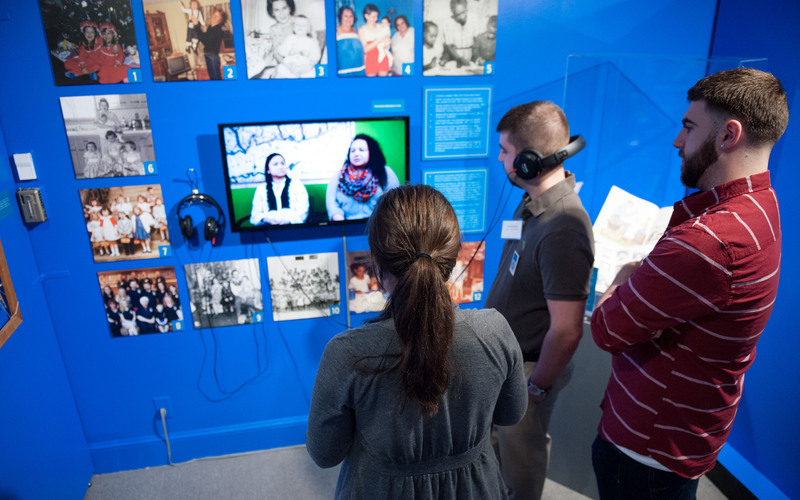 I collaborated with exhibit developers and my colleagues in the interpretive design team to launch this project. I was tasked to create a branding identity for the exhibition. 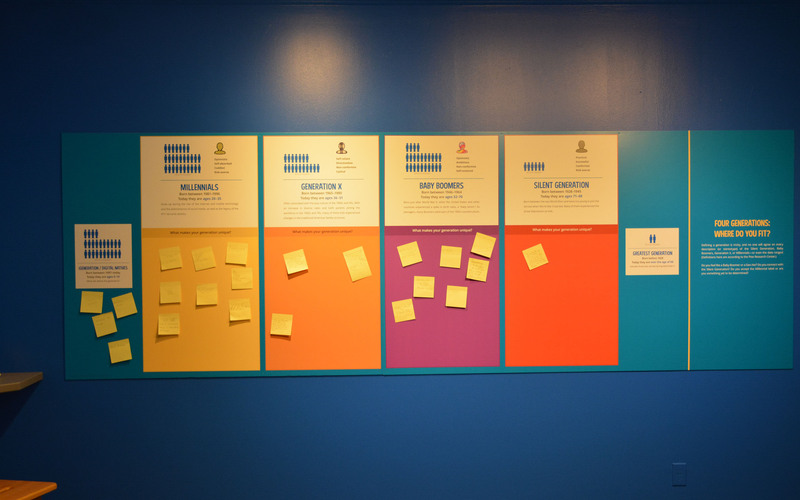 This branding would be reflected throughout the exhibit and marketing materials. I wanted to tap into the strong nostalgic feelings associated with the exhibition. Collaborating with museum educators, I also designed a family activity guide in the form of a booklet for visiting families. 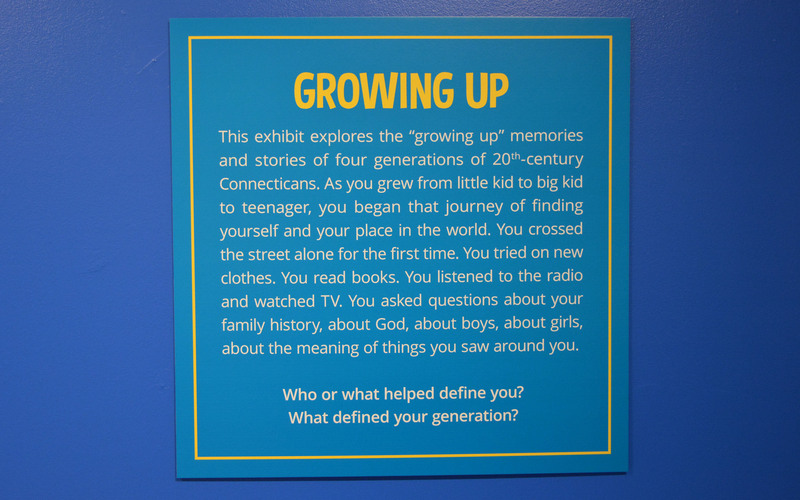 This booklet engaged young visitors in activities that encouraged them to exploring the exhibition while also facilitating dialogue across several generations of family members. 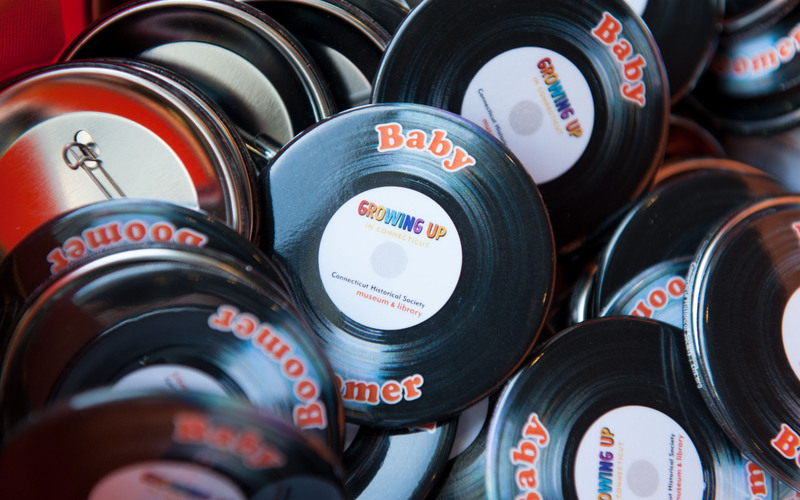 Knowing users like a tangible take away from their experiences, I also designed buttons to be handed out at the opening. 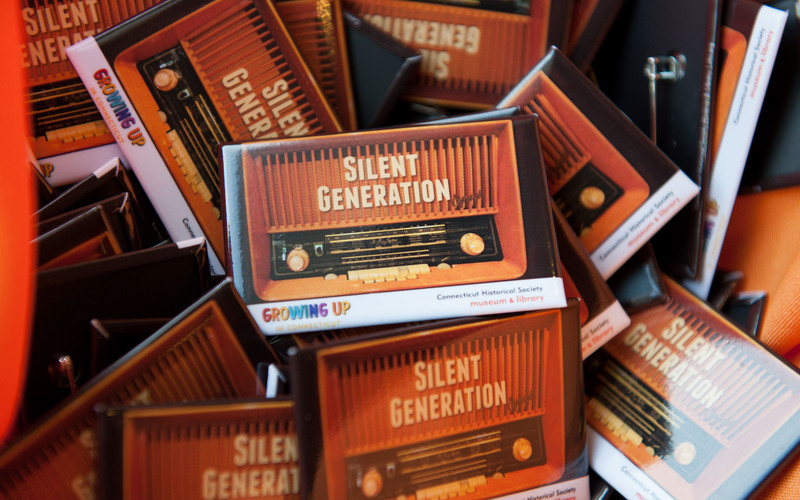 These buttons focused on the four generations we were featuring in the exhibit: Silent Generation, Baby Boomers, Gen X, and Millennials. Each generation had an associated musical motif associated with that particular era. 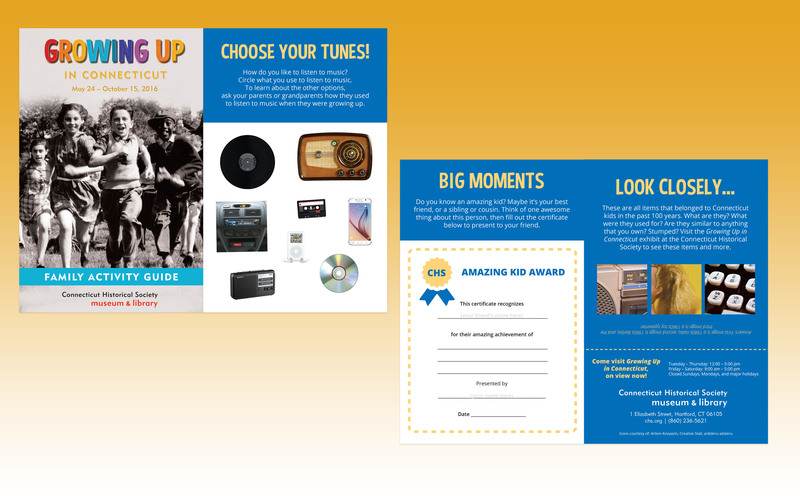 After creating and producing the marketing materials, I moved on to design the museum exhibit. 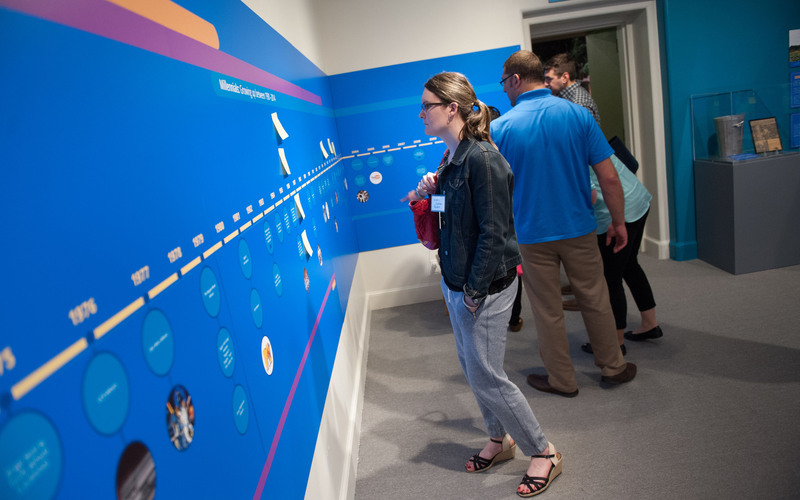 I orchestrated all of the exhibit design process, from translating initial ideas into visuals and interactives for visitors, which included presenting a floor plan to the exhibit developer. I also designed and managed the production of labels with an outside printing company. 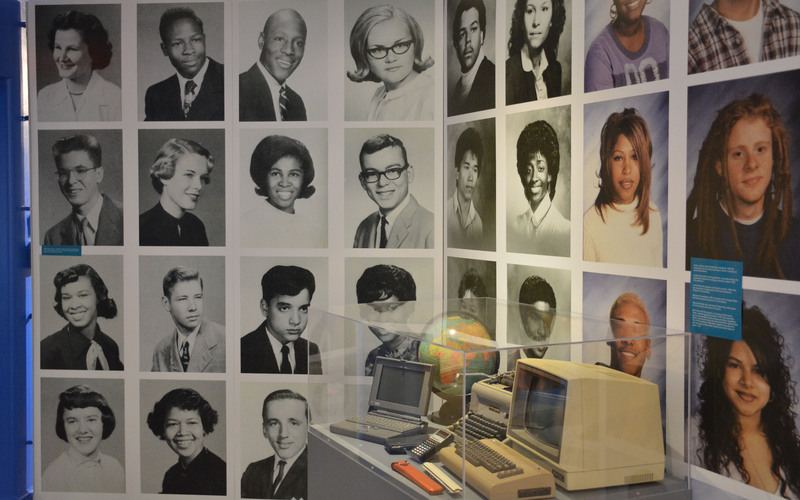 When visitors first entered the galleries, they were greeted with a range of yearbook photos to compare how styles have changed over time. 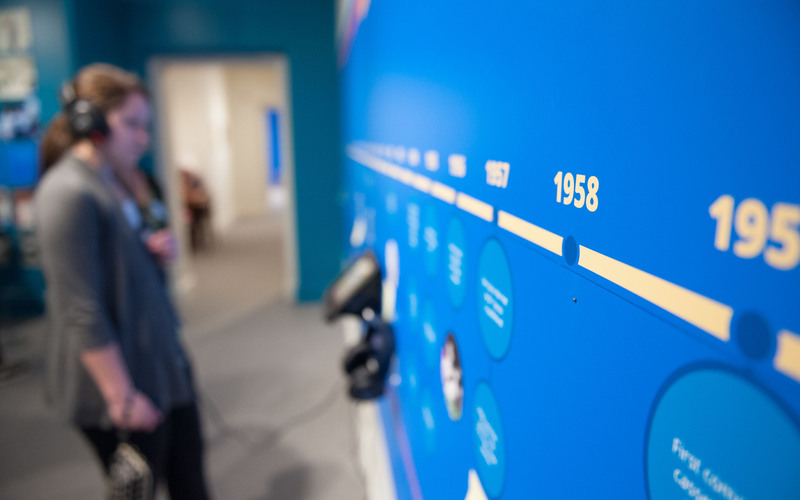 We strived to make this exhibition extremely interactive. 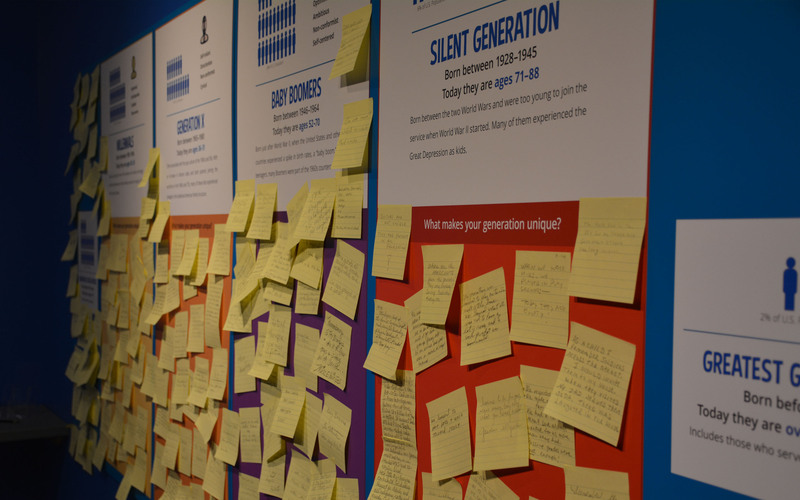 One of the first activities asked visitors to identify which generation they were from and what defined their generations. These displays included infographics describing each generation. 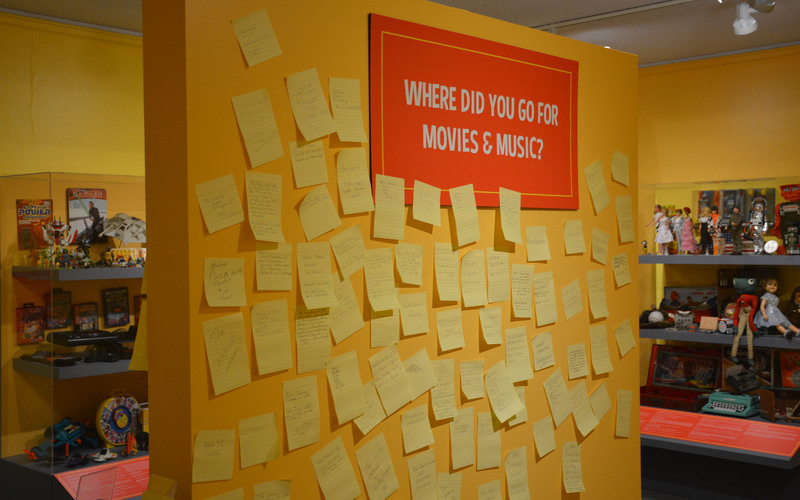 Like all of the interactives in the exhibition, these displays filled up fast with responses from visitors eager to contribute their experiences. 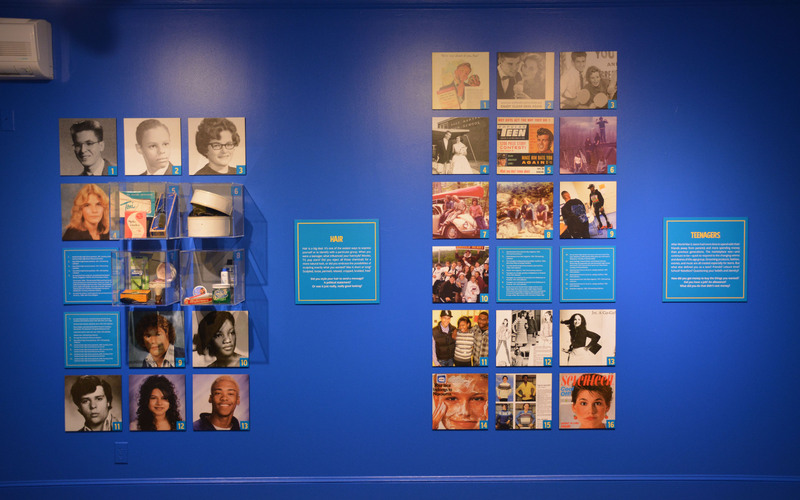 There were so many objects and stories we wanted to include in this exhibit and it was a challenge to include them within space and monetary constraints. I formulated a solution that involved designing a modular system where images could be interchanged with one another. This provided flexibility in regards to the volume of content we could display, organized images into themes, and was also cost effective. The image grid was useful when images supplemented objects. 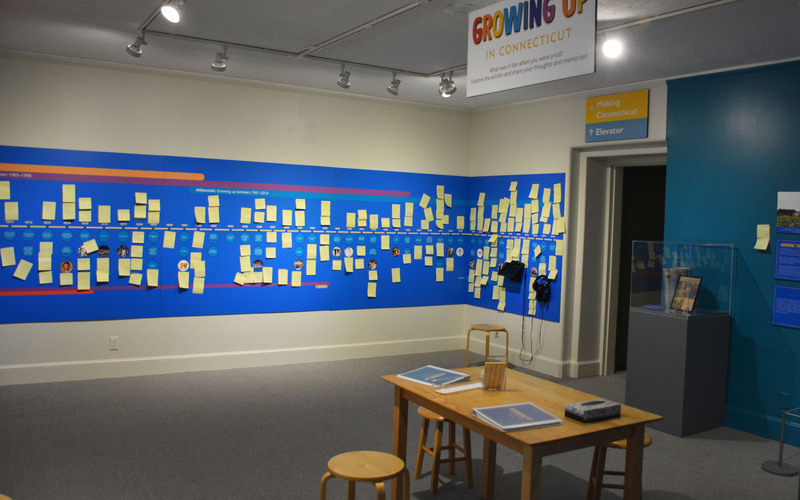 One of the most challenging parts of this project was the timeline interactive label. Due to its massive size (displaying the years 1925 to 2014) and the amount of detail involved, it required intricate design. 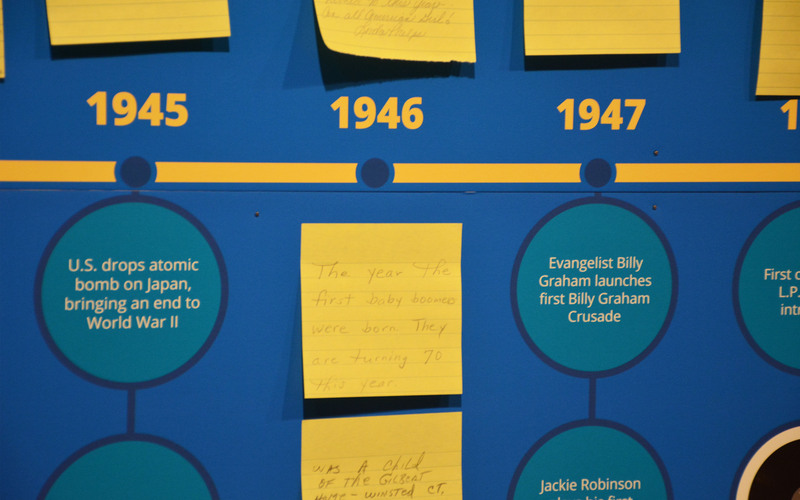 We left gaps to encourage visitors to add their own stories and events to the timeline. It quickly became one of the most popular visuals of the exhibit. 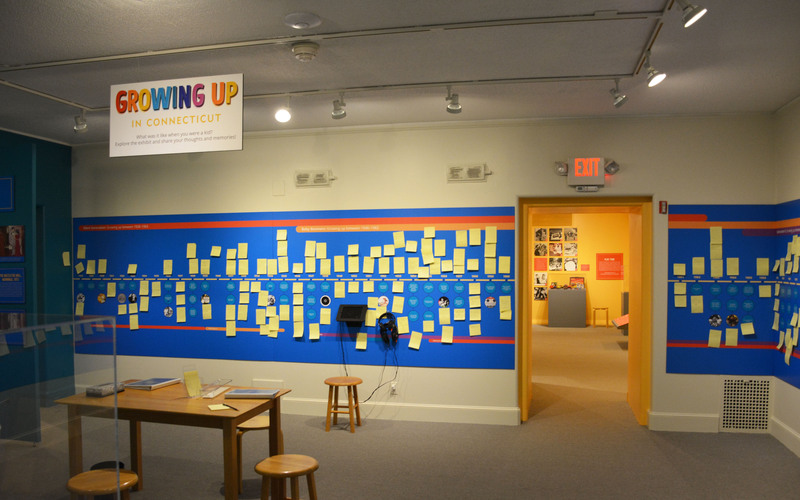 Visitors loved to record their childhood memories. 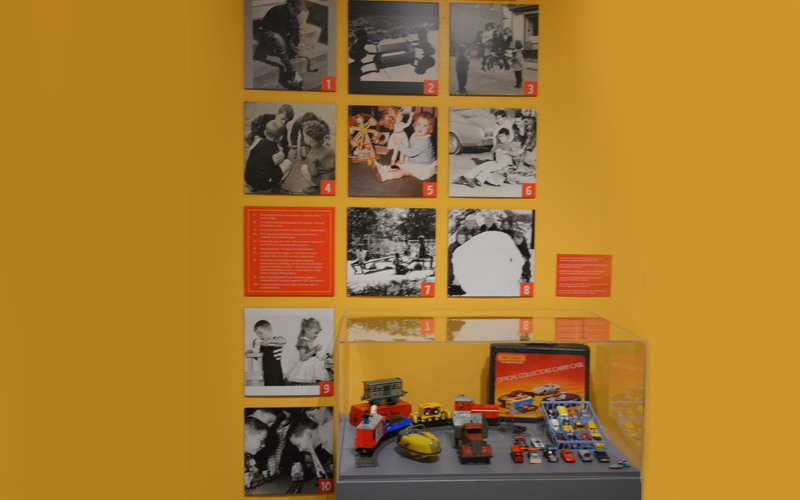 This room featured toys and games and I chose a bright, primary color palette to evoke the feeling of childhood. 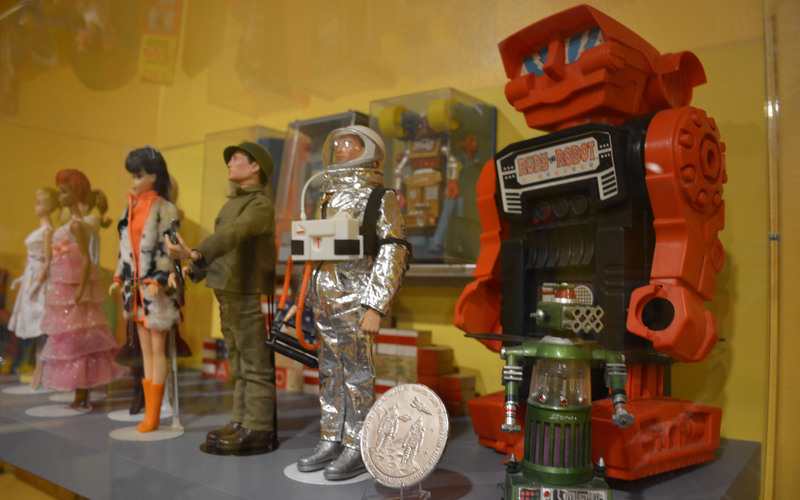 An incredible collection of toys was amassed from the general public, evidence of the users’ personal investment in this experience.